Camping cots are getting more and more popular, especially among car campers. And I don’t feel surprised about it. If you have some experience of sleeping on the ground and some sleeping on the cot, you know what feels better. No doubts about it. If you are new to camping and decided to go on the quest of finding the best camping cot for yourself, you are not alone. These days there are tons of products of different quality on the market and I am not surprised when people get overwhelmed with choosing the right camping cot. I wrote this article to help you, guys, understand the basics of choosing camping bed. In this article, I have also reviewed 5 best camping cots out there. Here I am focusing more on comparing the folding cots. If you want to learn more about features of sleeping cots and understand what to look for when buying one, read my article called “Camping Cot Buyer’s Guide“. 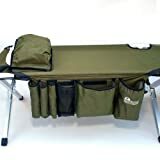 Earth Products Jamboree Military Style Aluminum Camping Cot has been evaluated as one of the best camp cots by people who used it in real-life situations. First of all, let me draw your attention to its durable reinforced legs (made of steel pipes). The second thing which makes this cot stand out is the ability to hold the weight of 350 lbs (~159 kg). If you are a big guy/lady, you can trust this bed. Third, this camping cot comes with a storage bag system which comes in handy no matter if you are a man or a woman. For a detailed in-depth review of the Earth Products Jamboree Military Style Aluminum Camping Cot click here. I would call this cot a classic one. It is simple yet reliable as can be. I give it my 9 points out of 10 (from me that’s a lot). There were almost 500 reviews on Amazon when I looked up the last time. Most of them are 4-5 stars. You can’t fake that. The cot stands out among others because it is large. People of 6 ft 8 in (more than 2 meters) can sleep comfortably on this cot. Plus, it holds a weight of 300 lbs (~137 kg). Not many sleeping cots out there can beat these parameters. The nice and handy feature is a small side table with an integrated cup holder. You will thank yourself when you are in a tent and have a place to put your cell phone and your flashlight. For a detailed in-depth review of the Coleman Pack-Away Cot With Side Table click here. This guy is a monster. It can hold the weight of 600 lbs (~273 kg)! Can you believe that? The cot is extremely durable and serves people for many years. The size of the cot is impressive – 84 (L) x 40 (W) x 20 (H) inches (~213 x 102 x 51 cm). Not bad, huh? Large people simply love this cot. One friend of mine switched from inflatable mattress to this cot and was happy as a child. When he used to sleep on a mattress, he used to wake up in the middle of the night because the mattress was half-deflated and he was touching the ground with his knees and elbows. After switching to the camping cot he sleeps like a child. A manufacturer is so sure about the quality of this product that he gives a limited lifetime warranty to every buyer. Now how does this sound?! For a detailed in-depth review of the Teton Sports Outfitter XXL Camping Cot click here. I like simple and easy-to-figure-out things. This cot is just like that. What I like the most about it is that it has a mattress. Not all camping cots have mattresses included. It gives a few extra points to Coleman ComfortSmart Deluxe Camping Cot. Overall, Coleman cots are a great choice. Even though this cot looks like a simple foldable bed, don’t be fooled by the looks. This cot can hold the weight up to 300 pounds (~137) kg. Yes, it is a bit bulky (because of the mattress) and you will probably not take it with you on a backpacking trip, but if you are going car camping for the weekend, it might be your best choice. For a detailed in-depth review of the Coleman ComfortSmart Deluxe Camping Cot click here. I picked the Coleman Converta Camping Cot because of its versatility. 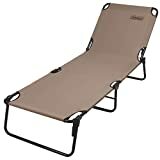 It can be easily turned to a lounge chair, which makes it stand out among other cots. Another thing what I like about this camping cot is that it is extremely easy to set up. Actually, no set up is needed – just unfold in and voila. If you are a big guy/lady, you have to be cautious, because this cot can hold weight just up to 225 lbs (~102 kg). If you are heavier than that, consider choosing another cot. For a detailed in-depth review of the Coleman Converta Camping Cot click here. As you can see, this is a double camping cot (a queen size cot). It doesn’t mean that it is the one you need, though. If you like to go camping alone, obviously, you won’t need it. But, if you are used to going camping with your spouse of a child, this cot might be your best choice. Kamp-Rite Double Kwik Camping Cot has proved itself in the field. My friends are using it (bought on Amazon) for 4 years already. And it is still OK. Just scratches from usual use and nothing else. The fabric is very strong, the metal structure as well. The only thing which may bother you is the bar in the middle. It may cause some discomfort, but, if you put a semi-thick mattress on the cot – this will make you fell like in your home bed. This type of camping bed is a rare one. You won’t find a queen size camping cot very often. For a detailed in-depth review of the Kamp-Rite Double Kwik Camping Cot click here. I like this invention a lot. I call it “invention” because the design of this bunk bed is unique. First of all, the legs are rounded which prevents them from getting deep into the ground and tearing the floor of the tent apart. The second thing which I like about this cot is that engineers made it transformable. This cot can be transformed into a comfortable couch. And this is a big deal. Third, extremely usable organizers. They can be used to store lots of small things. Plus, like with every camping cot, you have tons of storage space beneath the cot. There is one more cool thing about this bunk bed. You can purchase additional extensions which will lift the upper cot higher so that the person sleeping below has even more space. For a detailed in-depth review of the Disc-O-Bed Cam-O-Bunk Cot with 2 Organizers click here. 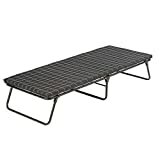 This camping cot ended up on my list of best camping cots mainly for one reason – it is extremely easy to set up and fold it back. Actually, there is no set up needed. Simply, unfold it and you have a bed. What is also great about this model is that you can choose from a variety of colors like tan, blue, orange and many more. Some interior designing here, huh? If you are higher that 6 ft (~182 cm), though, look for another cot because this one is going to be too short for you. For a detailed in-depth review of the Trademark Innovations Portable Folding Camping Cot click here. Kamp-Rite Oversize Kwik Camping Cot, as its name suggests, is a cot of a large size. So, if you are a big guy or lady (or you simply like large beds), this one may suit you well. Plus, it holds a weight up to 400 lbs (~190 kg) without bowing under the weight. The cot also features a nice storage pouch which comes in handy at night – you can keep your cell phone and a flashlight there. For a detailed in-depth review of the Kamp-Rite Oversize Kwik Camping Cot click here. I want you to see the whole picture before you decide what to use as your bed when camping – a camping cot, mattress, pad or a hammock. I have a strict rule which I apply to myself: “Never go shopping without a list and a budget”. And it always helps me. No matter what you are going to buy, know your budget. The cot may cost 40 dollars and it may cost 300 dollars or more. Be sure to set the maximum amount of money you are willing to spend on the cot and only then go shopping. Remember, that a camping cot is a long-time investment. If done wisely, the benefits will be felt for long years to come. Don’t get me wrong, I know that you will always find good and bad reviews for almost every product. However, there is always a majority of either positive or negative reviews. What I recommend, though, is to dig for details. Let’s say, for example, you are a heavy person. Then you better look for online reviews from other big people who will tell you whether the cot is suitable for heavy people. If you are going camping with your family, on the other hand, look for reviews from other families which share their insights online. Online reviews is a priceless source of information for someone who is about to invest his or her money in a thing or two. You can hardly get such feedback even in the real camping gear store. It is so simply because the seller will want to sell the product to you, usually, at all costs. So, set aside an hour or two and look for products reviews online to get a big picture about the camping cot you are willing to buy. Compare at least 3-5 camping beds and only then make a decision. Chances are, you will not foresee everything, but many things will be considered by you and the risk will be low. Everyone is different, therefore a cot which your friend enjoys might be very uncomfortable to you. Be careful – choose your cot wisely. Always check the length and the width of the cot before you decide to buy it. Be also sure to check the weight range – how many pounds it is designed to withstand. If you buy a cot wich is only designed to hold 250 pounds and you weigh 300 pounds, it will not last long. Would you buy a car of an unknown brand? I bet you wouldn’t. Why then you should consider buying a no-name camping bed. When doing so you may simply lose the money. Brands like TETON, COLEMAN and KAMP-RITE are world-known brands. These manufacturers offer a solid warranty. You may buy with confidence from them. You might be lured by lower price from unknown manufacturers, but this includes high risk. I wouldn’t recommend buying a no-name camping cot. Camping bed frames may be made of steel, aluminum or even wood. You should always pay attention to the way the frame is constructed. I would always look for photos and videos with where people try and review the cot and share their opinion. This may save you lots of time and money as well. 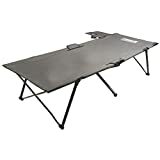 Some camping beds may look sturdy and, even though their frame is made of steel, the steel itself is too thin and they simply collapse under the weight of a sleeping person. The frame is the key to cot’s sturdiness. The fabric is as important as a frame. If the fabric of a cot is weak, it will tear and you will end up on the ground. Not a very pleasant situation, huh? Most reliable camping cots are made of thick polyester. Go for it when choosing your cot. Polyester is durable and serves for many years. It is also easy to clean this type of fabric. As I mentioned before, known brands offer a solid warranty. Simply because they stand behind their products. I recommend only choosing a camp cot with a limited lifetime warranty. Yes, you will pay a bit more, but at the end of the day, you will sleep knowing that if anything happens to the cot, you are covered. I consider a camping cot (like many other pieces of camping gear) a long-time investment. Therefore I recommend performing thorough research online before you pick the right camping bed for you. Cots for camping may last a season or a lifetime. I hope my reviews and tips helped you see the big picture and now you know what to do in order to choose the best camping cot for you. Great article. I have just purchased a coleman converta cot. I don’t go camping at all, it sits in my backyard and we use it a lot. Our family uses disc-o-bed bunk bed. We have two of them. Four people fit in one tent and we have plenty of storage spave beneath. Will never go back to sleeping on the mat again! Coleman Converta Cot is affordable but beware of the adjustable back. This trifold cot / lounge chair can cause serious harm. To use as a sleeping cot beware of the steel frame of the adjustable back. It slams down on top of the middle frame which caused a deep laceration to my son’s fingertip. When he was adjusting the chair to use as a sleeping cot, the top bar nearly amputated his finger. This happens because the fabric around the adjustable back frame becomes tighten forcing the adjustable back to slam down on the middle frame. The two steel frame that overlap and come together are an amputation and laceration hazard. That is a frightening thing you are telling here. Thank you! Your comment here is extremely valuable for those who decide to choose the Coleman Converta Cot.